Recently, Travelpro launched their new Maxlite 5 collection and it is lighter than ever. Yes, that is possible! 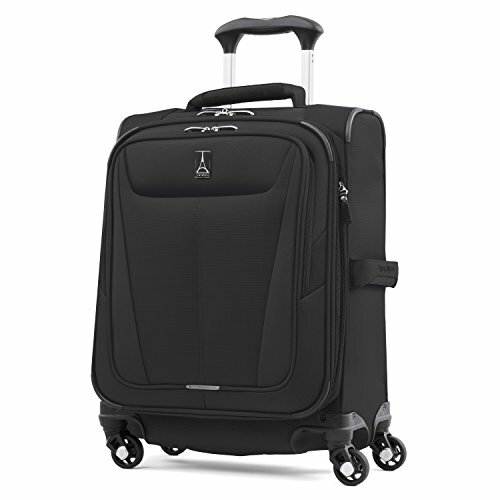 Travelpro value lightweight luggage, and this is their lightest yet. In this review we'll take a look at what exactly changed between the Maxlite 4 and 5 collections. We will also show you all the great features that this luggage is equipped with, but also what it lacks, so that you can know precisely what you are buying. Sounds good? Then let's begin this detailed review of the Travelpro Maxlite 5 luggage collection. Maxlite 4 Vs. Maxlite 5: What Changed? Travelpro Maxlite 5: Do You Need The Upgrade? When Maxlite 4 first came out it featured an improvement in weight over the Maxlite 3 collection. The same thing happened with the Maxlite 5 luggage - all suitcases in this collection are about 0.5 lbs lighter than the Maxlite 4 luggage. And that is the main difference between these two Travelpro luggage collections. All the other features that you loved on the Maxlite 4 remain the same on the Maxlite 5. Just like the ones you didn't really like didn't change at all - give us a lock Travelpro! But, the emphasis is on the weight - with the newest Maxlite collection, Travelpro wants you to focus on the weight of the items that you packing, rather than the weight of the suitcase. One thing to note is that these are not the only three suitcases in the Maxlite 5 collection. 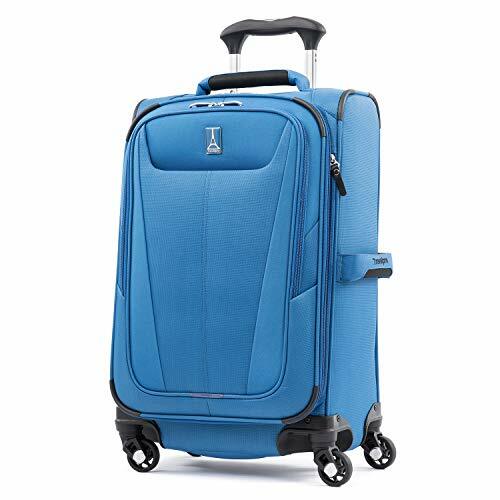 But, they are by far the best ones - for example, there is also a 22" suitcase with the same dimensions and weight as the 21" one, but it features in-line skate wheels instead of spinner wheels. I've decided to focus on these three suitcases simply because they are the the best the Maxlite 5 collection has to offer. The larger two suitcases are checked baggage, while the two smaller ones fit most airlines' carry on sizing requirements. Even though the larger 21" suitcase is slightly taller than you would expect a carry on to be, Travelpro claims that their tests showed it can fit into most overhead compartments easily. If you don't want to take any chances, go for the 21" international carry on - it will definitely be allowed inside the cabin. 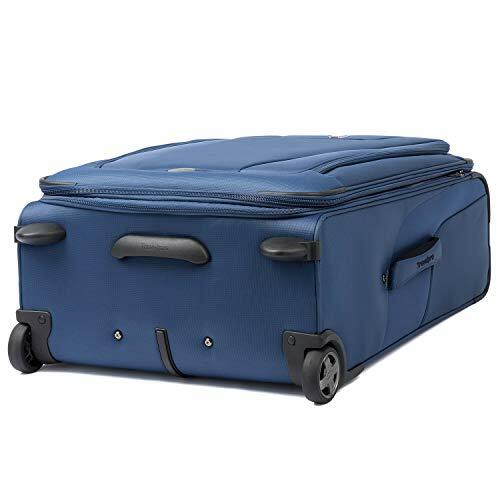 I think the weights of the luggage speak for themselves - it is not that often that you find such lightweight and high quality suitcases at such an affordable price. But yeah, we've established that the main selling point of the Maxlite 5 collection is their weight - so, what about all the other features? 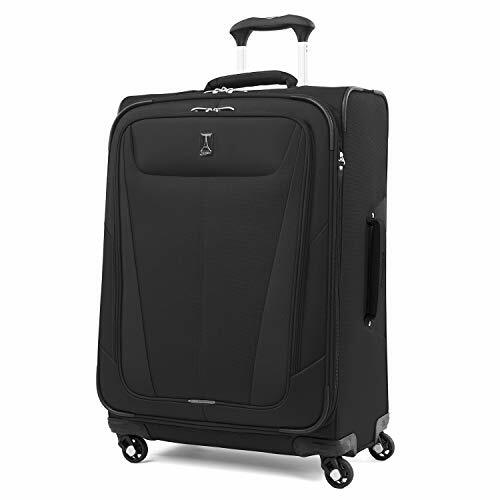 Let's find out exactly what you get when you buy one of these Travelpro suitcases! Obviously, the material that the luggage is made of is going to be responsible for most of its weight - along with a few other factors. So, it is probably not surprising that the Maxlite 5 collection is made of polyester - one the most used materials in softshell luggage. 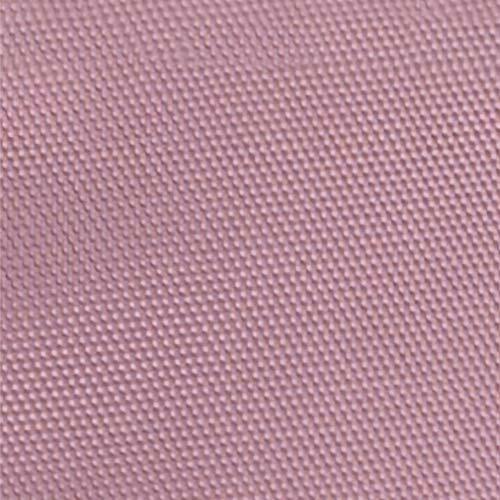 Polyester is also used in manufacturing backpacks very often, due to its strength and affordability. But the fabric in the Maxlite 5 suitcases isn't just plain old polyester - it is also coated with a layer of DuraGuard, which improves the suitcases' resistance to water and stains, and overall durability. That basically means that your luggage should look as good as new for a long time. There is one more design feature that greatly impacts the durability of these Travelpro suitcases - a lightweight Honeycomb frame system. And when you look at all these design features combined, you get one sleek, lightweight yet very sturdy and weather resistant suitcase. 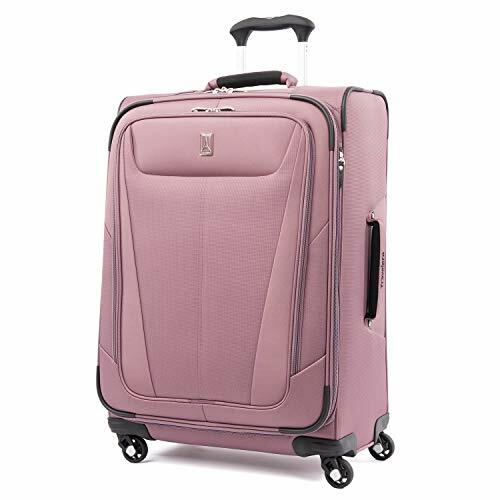 Spinner wheels are just one of the reasons why these three Maxlite 5 suitcases stand out from the rest of the collection. But they are the most important reasons, as in-line skate wheels do not come close to them. A spinner wheel is a wheel that can turn 360 degrees. On the Maxlite 5 luggage you get four of those wheels, which in turn give you excellent maneuverability of your suitcase. They roll like a dream in any direction, and they guarantee that you will never again have sore arms because you dragged your luggage around for hours. 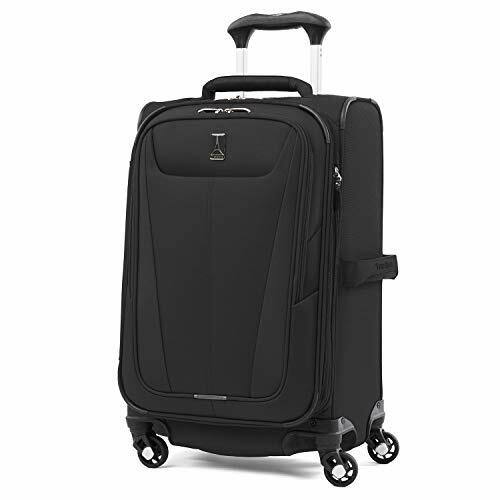 The wheels on this Travelpro luggage come attached to corner guards, which will protect your suitcase even more. And also improve its overall sturdiness. One thing to note about spinner wheels is that they generally tend to be fragile. Not too much, but if you don't want to break them, just avoid rolling your suitcase up or down the stairs, or across some really rocky terrain. The Maxlite 5 luggage is equipped with a lot of handles. It features top, side and bottom carry handles. So, when you actually have to pick up your suitcase, you will have plenty of options how to do it. But the wheel handle is much more important, as you will generally be using it more often. It is lightweight, telescopic and it can be locked into two positions when extended - 38" above ground, and 42.5". With those two setting, even the really tall travellers should be able to adjust the PowerScope Lite handle to their height. And there is one more really cool thing about the wheel handle on the Maxlite 5 luggage - it features Contour Grip technology. That stands for rubberized touch points, which make the maneuvering of the suitcase even easier. Just like with most other softshell luggage, these Travelpro suitcases have a single packing compartment. But it is pretty spacious, and it should be more than enough for your travels. 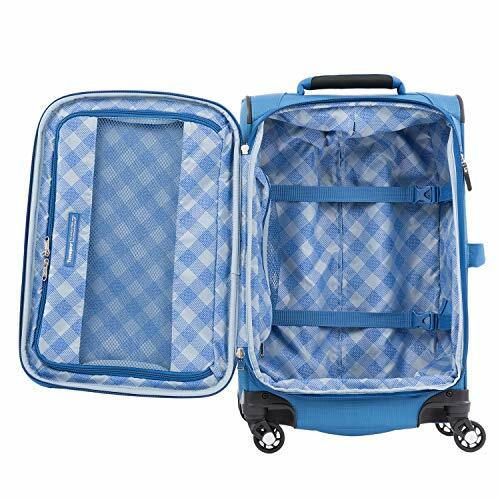 It is also fully lined with fabric whose color matches the color of the suitcase's exterior. For one thing, you can check out the capacities of these suitcases in the table at the beginning of the review. Go do that if you haven't already. Those numbers will tell you much more about how much stuff you can fit in these suitcases than the photos will. But the photos will tell you that you get two elastic tie down straps in the packing compartment that are supposed to hold your belongings in place. In addition to that, there is also a small zippered pocket inside the main compartment, as well as a large zippered pocket on the top flap. That means that you'll be able to sort your items and divide them into separate compartments, for easy organization. Expandable. That is one of my all-time favorite features of luggage. You get the zipper for expansion right next to the opening zipper, and it will give you two additional inches of packing space. That could be a life-saver sometimes, particularly if you tend to return from a trip with more items that you originally brought. However, note that the smaller two suitcases might not be allowed inside the cabin when they are fully expanded. Large Packing Compartment. We often see this on softshell luggage, and very rarely on hardshells. But it is a great feature that really helps you stay organized when packing. In addition to that, those of you who are far from organized will love this feature even more - whatever you forgot to pack in the main compartment you can just stuff into the external front pocket. 5 Color Options. 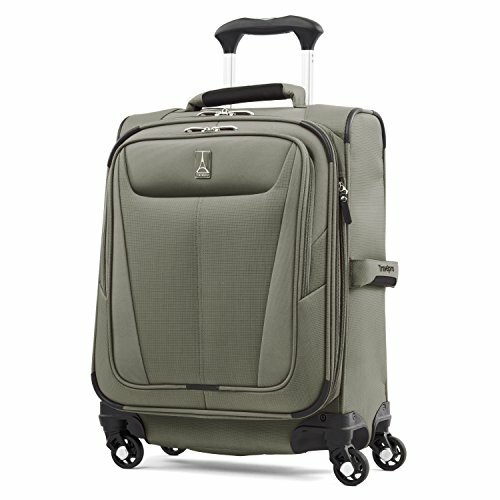 Travelpro don't seem to be fans of crazy luggage colors like some manufacturers, but the Maxlite range does come in 5 colors though. The pink and the blue suitcases look pretty cool to me, and they are a great way to brighten up the dull hours spent at the airport. But also to stand out from hundreds of people who are dragging around black suitcases (and accidentally take yours). No TSA lock (but locking loops on zippers). Most hardcases these days have built in TSA locks, so it's no surprise this one doesn't have that (softshells generally don't) BUT Travelpro have included locking loops on the zippers. So, you should buy a TSA approved lock and use that badboy to keep the thieves at bay! If you already own the Maxlite 4 suitcase, I don't think you really need the upgrade. That's because all the features stayed pretty much the same, and the only thing that changed from that collection to this one is the weight of the suitcases. 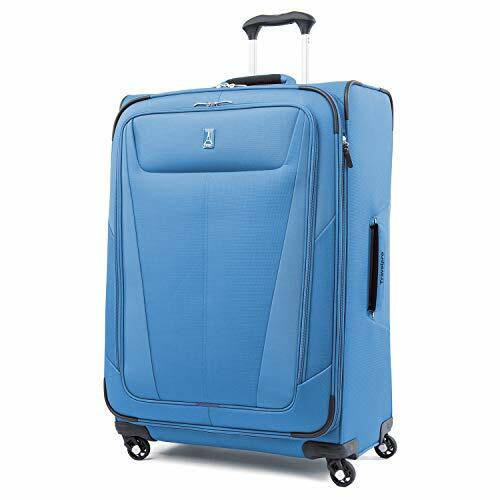 That being said, if you own the Maxlite 3, 2 or pretty much any other suitcase that isn't nearly as good as this one, then you definitely need to upgrade. You can really benefit from the lighter weight of the Maxlite 5 luggage, as well as all the other amazing features. That would be the spinner wheels, the spacious packing compartment with expandable capacity and all the different carry and wheel handles. The Maxlite 5 will really help you travel like a pro. After all, this is the brand that's most popular with cabin crew members from all over the world. And if it is good enough for people who spend most of their time flying from point A to point B, then you be sure that it is going to be good enough for you. Check out the suitcases on Amazon - you still need to see just how attractive their prices are. And if you are interested to learn more about Travelpro and maybe take a look at some of their other luggage, then be sure to check out some of these other posts.